The term “Khmer-Krom” denotes the ethnic Khmer in Kampuchea-Krom. The term “Khmer-Krom” is used to differentiate from the Khmer (Cambodian) who live in Cambodia. Physically, the Khmer-Krom people look exactly the same as the Khmer in Cambodia. Thus, it is not difficult to distinguish Khmer-Krom from Vietnamese people in Kampuchea-Krom, especially in the Mekong Delta. The Khmer-Krom skin color tends to be darker than the Vietnamese. They usually have black, wavy hair, and dark brown eyes. Their eyebrows are big, dark, and short. Khmer is the language spoken by the Khmer-Krom. Khmer-Krom culture, customs, and traditions are deeply link to Cambodia. But there are subtle differences that distinguish Khmer-Krom from their Northern cousins. The Khmer-Krom people have their own unique culture that is totally different from the Vietnamese culture. Approximately, there are about 7 million Khmer-Krom people living in Kampuchea-Krom and about 1.24 million around the globe. The Vietnamese government incorrectly claims that Khmer-Krom population is only about 1.3 million. Many official identification cards of the Khmer-Krom Buddhists were incorrectly written as “Ethnic Vietnamese” or “No Religion” creating the misconception that they are not Khmer-Krom. A popular Khmer-Krom motto is “Nation – Religion – People”. They believe that the survival of one depends on the other. Theravada Buddhism is deeply rooted in the Khmer-Krom culture. Approximately, ninety five percent of Khmer-Krom people practice Theravada Buddhism from generation to generation for almost two thousand years. There are over 25,000 Khmer-Krom Buddhist monks and more than 560 Khmer Krom Buddhist temples scattered all over Kampuchea-Krom (See Appendix B for a list of the oldest Khmer-Krom temples in Kampuchea-Krom). Each of these temples is surrounded by Khmer-Krom villages and Khmer-Krom rice fields. The monasteries and the farms are the backbone of the Khmer-Krom unique national identity. The Religion and the Land are the essence of the Khmer-Krom. The monistaries safeguard the Khmer language, culture, tradition, custom, foods, character, and personality. Buddhist teachings — Love, Compassion, and Honesty— are the moral standards for the conduct of Khmer-Krom people. Traditionally, most of the Khmer-Krom young men have been ordained to become monks for some period of time during their adult up lives. By committing themselves to follow the principles of Lord Buddha’s teachings, these people are considered by their communities to be the honorable and respectful persons with a high standard of moral value, strong discipline, and good education. They become better, more mature, and humble gentlemen. It is such a noble mission in their life-time which makes their families, relatives, and friends very proud of them. Chol Chnam Thmey (ចូលឆ្នាំថ្មី) (New Year) is the most important holiday of the year. According to the Lunisolar calendar, Khmer people observe New Year on the thirteenth day of April. However, in the event of a Leap year, New Year is observed on the fourteenth day of April. The New Year celebration lasts for three consecutive days. In addition to the Khmer people, other Southeast Asian people from Laos, Thailand, and Myanmar also observe New Year during mid-April. An astrologer usually determines the precise date of this high-spirited celebration. Khmer-Krom people refer the festival of Bonn Pjum Ben as Bonn Don-Ta. The Don-Ta festival is the second largest festival after the Chol Chnam Thmay (New Year) festival. It is the Khmer Festival of Souls. The focus is on blessing of the souls of our ancestors, relatives, and friends who have passed away. People of all ages go to Khmer Buddhist temples to make traditional offerings and pray. This spiritual and religious event of Bonn Pjum Ben takes place on the 15th day of the lunar calendar year (falls between the last week of September and the first week of October). The exact date may vary based on the lunar calendar. There are 14 mini Bonn events (Bonn day 1, Bonn day 2, etc.) to take place in days prior to the final Pjum Bonn on the 15th day. In Cambodia, Pjum Ben festival is a national holiday. In Kampuchea-Krom, the Vietnamese authorities do not recognize it as a national holiday. However, some schools did allow Khmer-Krom students to take one or two days off to spend time with their family and to celebrate the festival. Some students are scare to take days off because they may behind their school work because the Vietnamese students still go to school on this festival. The Ork Ombok festival is the third largest festival of the year. It is also known as Sompeah Preah Kae (Worshipping the Moon). It takes place on the 15th of the 10th lunar month. It is a time that the Khmer-Krom starts harvesting their rice. Ombok is made from sticky rice. They are flat grains of rice. To produce Ombok, the fresh sticky rice that Khmer-Krom just harvested are placed in a pan and stir-fried. When the sticky rice start popping off the husk, the sticky rice are poured into rice mortar and pounded with wooden pestles alternatively and steadily by two people. Pounding stops when the sticky rices become glutinous. They then take the sticky rice out of the mortar and winnow to separate the husk from the Ombok. On the night of the Ork Ombok festival, the Khmer-Krom go to their local temple to celebrate. At the end of the Ork Ombok festival, some temples in Kampuchea-Krom also have a flying-lantern release ceremony. Unfortunately in recent years, the Vietnamese government has forbidden the Khmer-Krom from releasing the flying-lantern with the reason that it might cause the fire. In reality, the flying-lantern never causes any fire (people in Cambodia and Thailand have released the flying-lantern just like the Khmer-Krom). The Vietnamese government is just tactically step by step to eliminate the traditional culture of the Khmer-Krom. The celebration of Meak Bochea (Pali: Māgha Pūjā) usually happens in March. It is conducted on the fullmoon day of third lunar month to commemorate the day of 1,250 Bhikkhus (they were all enlightened and ordained by the Buddha). They met fortuitously on the full-moon day, and Sakyamuni expounded the PATIMOKHA, the rules of the order at the Veluvana Temple. The celebration of Visak Bochea (Pali: Vesākha Pūjā) usually happens in May. It is conducted on the fullmoon day of the sixth lunar month to honor the Sakyamuni Buddha’s Birthday, Enlightenment, and Parinibbana (passing-away). The celebration of Chol Preah Vasa usually starts in July. It is conducted to support the Buddhist monks and laypeople for their three months of rain-retreat (or Buddhist Lent to fully study and practice the Dhamma). The monks are not allowed to go anywhere unless it is urgent. If something important happens (his parent passed away, etc…), they are allowed to go away for one week. The celebration of Chenh Preah Vasa usually happens in October. It is conducted to appreciate the fulfillment of Buddhist monks and laypeople who completed their three months rain-retreat practice of the Dharma. Now, they are free to travel as needed. The celebration of Kathin (Kathina Dana) usually happens in October. It is conducted to express gratitude and offer Saffron Robes to Buddhist monks who have successfully graduated their three month rain-retreat of Dhamma practices during Vasa. This offering happens for 29 days which is counted from the first day of Buddhist monks out of Lent (end of Vasa). In Kampuchea-Krom, there are two well-known traditional sports that Khmer-Krom people have participated for centuries are Ox Racing and Dragon Boat Racing. Ox racing is a traditional sport that is celebrated only by the Khmer-Krom in Moth Chrouk province. Most Khmer-Krom in Moth Chrouk use Ox’s plow to harrow their rice-fields. The Ox can run very fast with its harrow, so Khmer-Krom people use it to race. Unfortunately, the Ox race of the Khmer-Krom in Moth Chrouk province has been used to attract the tourists for the Vietnamese government. 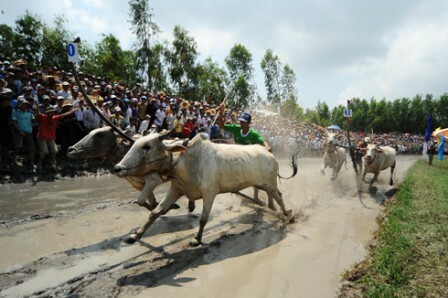 Since 1992, the authorities of Sway-Ton and Kro-Bao districts hold the Ox race on October (one year in Sway-Ton district and another year in Krabao district) during the Don-Ta festival to attract tourists. The authority of each district dedicates a field just for Ox race and sells tickets to whoever wants to watch the race. The Vietnamese police use the Khmer-Krom’s rice-fields near the Ox race’s racefield for motocycle and car parking. The benefits receive from the parking fee were not shared with the Khmer-Krom. This is a Khmer-Krom sport, but there are not many Khmer-Krom who participate in this sport in recent years. The Khmer-Krom used to complain about the unfair results that they tend to get from biased Vietnamese referees. Most of Khmer-Krom are living in poverty, thus they cannot afford to buy the ticket to watch the race. It is sad to see a Khmer-Krom traditional sport exploited for tourism and benefits tfor he Vietnam authorities. 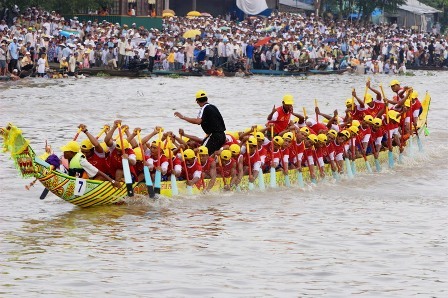 During the Ork Ombok festival, the Khmer-Krom people also organize the regatta festival which is known as Pronang Touk Ngo (or Bonn Om Touk). In Khmer, Pronang means “race” and Touk Ngo is a “long boat”. The Touk Ngo’s front has a carving that is decorated as a dragon’s head or naga serpent’s head. The Khmer-Krom have organized the Pronang Touk Ngo by themselves for hundred years in different provinces in Mekong Delta, such as: Khleang, Pol Leav, Preah Trapeang, Long Hor, Kramoun Sor. Each Touk Ngo team usually belongs to a temple. Besides racing to commemorate the Khmer-Krom ancestor’s navy troops, the Khmer-Krom want to win the race for the fame of their temple’s team. In recent years, the Vietnamese government has exploited the Pronang Touk Ngo festival to attract tourists. The Vietnamese government tactically shows to the world that it helps organizing the festival for the Khmer-Krom. In the reality, the Vietnamese government makes lots of profits from providing the tourist services and advertisement. The Khmer-Krom paddlers don’t gain a penny from those profits, except the winning teams may get some awards.